Expert faculty who are interested in sharing their assessment strategies submit a proposal to the Faculty Senate Assessment Committee, the Office of Institutional Effectiveness, and the Faculty Center for Innovation. Faculty with selected proposals will present one or more sessions at the Assessment Institute to foster continuous learning for assessment practices. The primary venue for assessment learning is the annual Assessment Institute, which brings together Deans, Program Coordinators, Directors, Chairs, and all full-time faculty to participate in faculty-led workshops for learning or improving assessment practices. 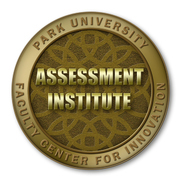 The Assessment Institute is co-coordinated by the Chair of the Faculty Senate Assessment Committee and the Office of Institutional Effectiveness, with substantial participation from the Faculty Center for Innovation.